My favorite meat by far is lamb. When seasoned properly, it is so tender and tasty. I enjoy it both in whole pieces and in ground form. I recently made meatballs using ground lamb, which is something I haven’t tried before. The filling was flavored with fresh mint, cumin, smoked paprika, smoked pepper, smoked sea salt, Worcestershire sauce, cayenne powder and lemon juice. I browned the meatballs in a non-stick pan and finished cooking them in marinara sauce. Usually I add bread to the meat but replaced it with quinoa to make the dish gluten-free. Simple and delicious! 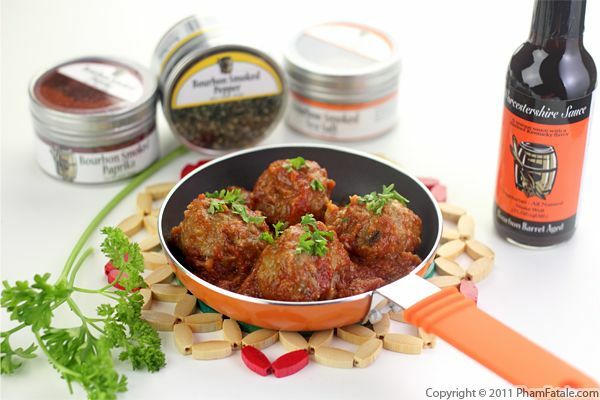 I was introduced to Bourbon Barrel Foods products and used them when making these meatballs. I absolutely LOVE the unique flavors of their soy sauce, Worcestershire sauce, sea salts and spices. They are some of the most interesting and innovative ingredients I’ve used in a very long time. Annie from Bourbon Barrel Foods was kind enough to agree to give away a bottle of their Bourbon Barrel aged blue grass soy sauce, "the ONLY microbrewed Soy Sauce made in the U.S.", to three lucky Pham Fatale readers. Just submit your email to the Bourbon Barrel newsletter below before Monday, Oct 31st, 2011 for a chance to win! 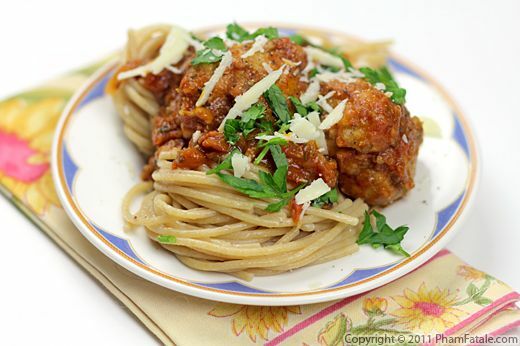 If you're looking for a delicious meat ball recipe, look no further. I grind both beef chunks and veal for added flavor, but the real secret is that I added bread that I soaked in milk. I learned that trick from a chef in Florence, Italy when I was a teenager. The mixture is flavored with various herbs, Parmesan cheese and binded with a few eggs. All that is left is to make your own tomato sauce. I browned each meatball in a non-stick pan, then let the meatballs braise in the homemade tomato sauce. For a Vietnamese version, check out thịt viên or my mắm chưng thịt recipe, and for an Indian version, try kofta or kebab. Each culture has its own variation and it's equally delicious!